I’ve been slowly applying and leveling coats of shellac on the handle of the saw I’m making. I’m probably overdoing it, but I want to have a nice glassy smooth finished handle. While I’m doing that I’m thinking ahead to setting the teeth and sharpening it. Somewhere I have an old saw vise, but I wasn’t really happy with it the last time I used it – it has teeth meant to be driven into the top of the bench, and then it needs to screwed to the front of the bench. Not ideal. There are a lot of home-brew saw vises, and a googling turned up several ideas. The simplest one I saw that overlapped with materials I have underfoot already was the “Lie-Nielsen Saw Vise” that I found on Close Grain. It’s simplicity in itself. 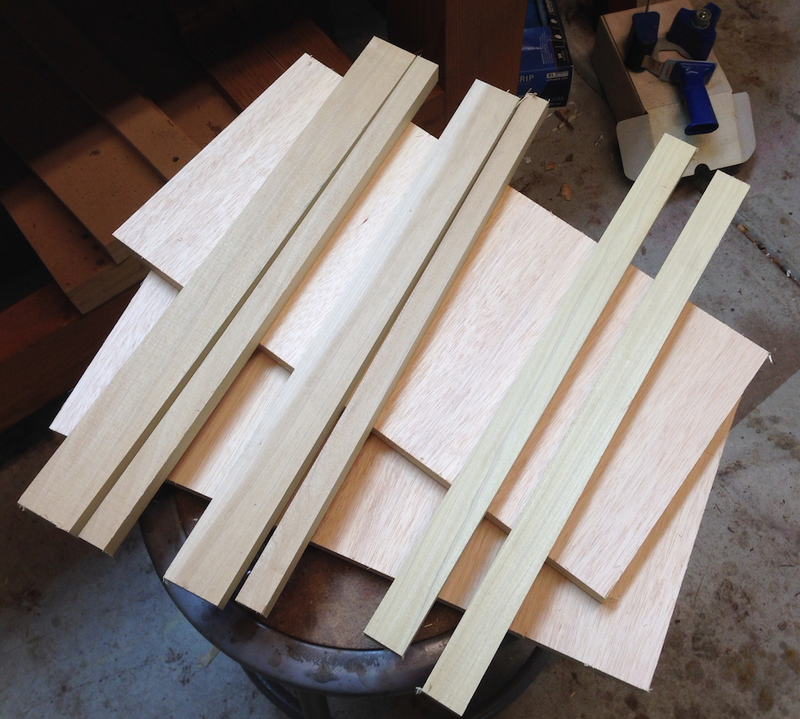 I cut two pieces of 3/4″ ply to 9″ x 18″, which just fit in a scrap left over from the quickie TV table I built. I has a length of 1″ x 3″ Poplar laying against the wall. I cut one 1″ length and ripped it in half to make a pair of cleats. 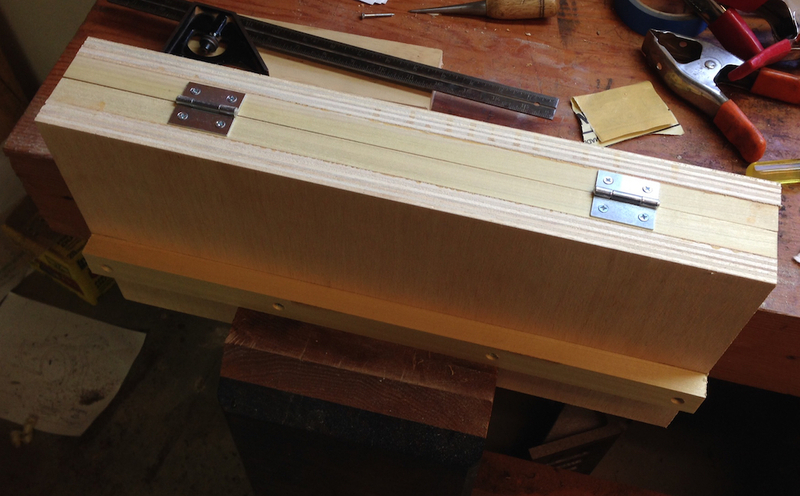 Two more 18″ lengths were ripped into a 3/4″ wide strip and whatever was left. The assembly was just glue and screws. 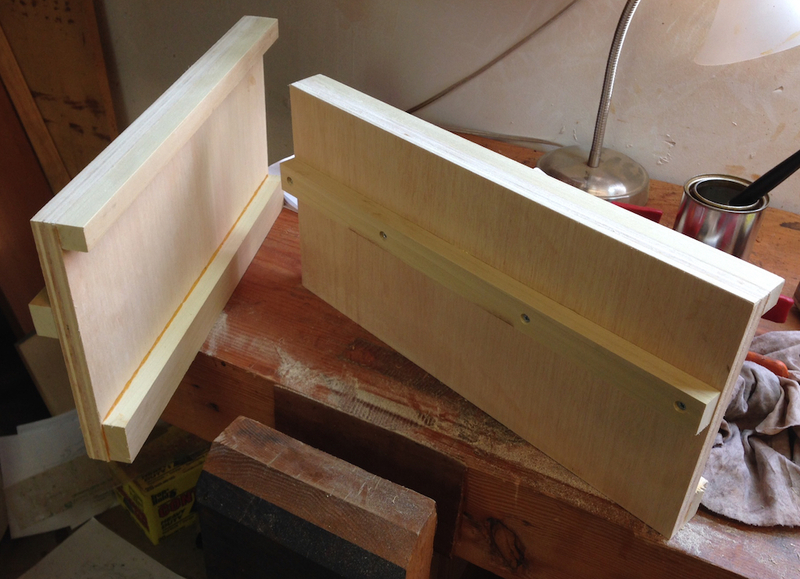 I glued one wide strip and one narrow strip on each piece of plywood, then screwed the cleats to the outside faces. 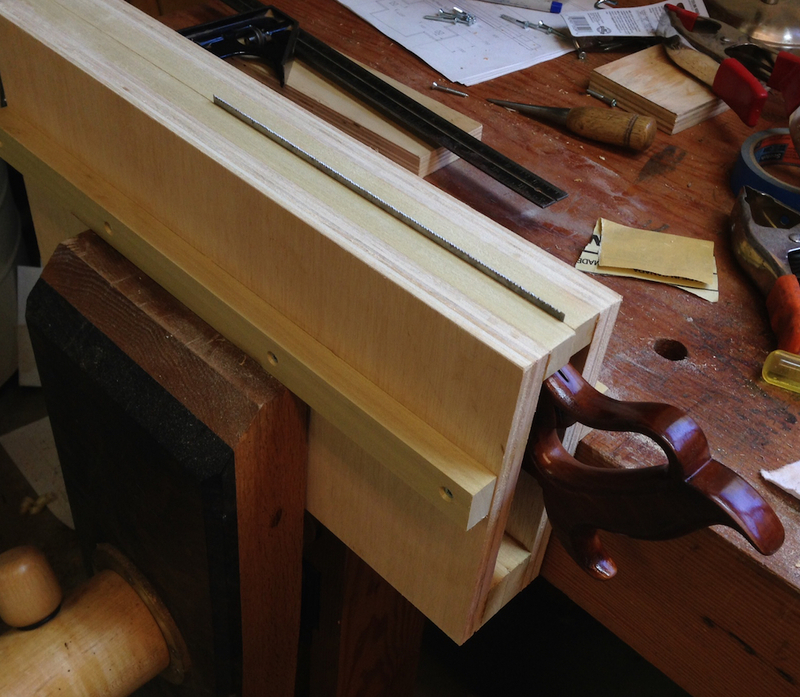 The narrow strips are the jaws of the vise. I used hinges at the bottom, but strips of leather or even thin plywood would probably work. It just needs to flex enough to slide the saw in. And it’s done. It took as long to upload the photos and write this post as it did to make. The cleats sit on the top of the leg vise and bench to keep the vise from falling it’s opened. I’m going back out to the shop now to add a strip of leather to the jaws to make sure they hold the saw plate securely. Such timing, I need a saw vise. You just saved me some cash 🙂 Its perfect in its simplicity. I too have been searching for a DIY saw vuse. I came across this one, as well as a few others. I do not care for the sharp corner on the outside edge, next to the blade. I thought about beveling the top or otherwise dressing it up, but it works really well like this. I can print and tape tooth spacing and fleam guides, then sight down on from above to keep the file where it needs to be. Good idea. Paul Sellers showed his method of retoothing a blade, which was pretty cool. I’ve read the method where a guy places a small wooden block onto the end of his file, with the angle laid out on it, so all you have to do is keep the block parallel to the saw plate, eyeball the 12 degree angle and sharpen away. It was the “Saw Filing – A Beginner’s Primer”on the Vintage Saws website. Very cool write up.